As yet another round of six-party talks fail to produce any results, world leaders are groping for ways to keep Iran negotiating at all. The multilateral talks on Iran’s nuclear program are increasingly reminiscent of the talks on North Korea’s nuclear development. When it became apparent that the parties were locked in mutually uncompromising positions, Pyongyang brushed aside economic pressure and proceeded with its nuclear program unmonitored, if not quite successfully. In the case of Iran, it appears that the international community has failed to present any alternative to this unpleasant déjà vu scenario. The latest round of six-party talks on the Iranian nuclear program ended in Baghdad on May 24. After some extremely strained meetings, the negotiations essentially reached an impasse. The six world powers demanded that Iran halt uranium enrichment to 20 percent and sign an additional protocol to the Nuclear Non-Proliferation Treaty that would subject Iran’s nuclear sites to full international inspection. In return, EU High Representative for Foreign Affairs Catherine Ashton, who led the negotiations, promised Tehran no further sanctions and the cancellation of the demand that Iran send spent nuclear materials abroad. Tehran countered with an alternative five-point plan covering both nuclear and non-nuclear issues. According to Iranian mass media, it is centered around lifting the sanctions – a condition the six world powers could not accept. Iran accused the international mediators of caving to U.S. demands. “We believe that the United States is the real reason behind our deadlock,” said an Iranian representative who wished to remain anonymous. Meanwhile, according to media reports, the talks were only rescued from complete failure by the efforts of Chinese and Russian diplomats who met with their Iranian colleagues after the Baghdad round ended. A new round of talks is scheduled to be held in Moscow on June 18-19. In the run-up to these talks, Russia and China will in all likelihood try to persuade Tehran to compromise. Iranian President Mahmoud Ahmadinejad is expected to attend a summit of the Shanghai Cooperation Organization in Beijing on June 6-7. According to a source with China’s Ministry of Foreign Affairs, President Hu Jintao will meet with Ahmadinejad then to discuss ways to resolve the Iranian nuclear issue. Russian President Vladimir Putin, who is also scheduled to attend the summit, is likely to meet with his Iranian counterpart as well. Both Russia and China oppose tougher sanctions against Tehran and prefer taking a phased approach to solving the Iranian nuclear problem, involving the relaxation of international sanctions in return for some international monitoring of Iran’s nuclear program. The devil, however, is in the details. In the case of similar talks with North Korea, negotiations stalled when the parties failed to agree on who should make the first move: either North Korea, which was supposed to halt its nuclear program, or the Western countries Pyongyang expected to provide economic and humanitarian aid along with security assurances. Without an agreement, the UN went for economic sanctions and threatening statements against North Korea, which eventually prompted Pyongyang to walk away from the talks in 2008 and announce its intention to build up its nuclear program. Now, the situation with Iran is developing along the same lines. In a situation of mutual mistrust, each side is waiting for the other to take the first step. Iran demands that first the sanctions be eased, while the six mediators are looking to Tehran to agree to complete inspections. No one wants to appear weak. The upcoming Moscow round of talks may easily be the last. The EU oil embargo against Iran comes into force on July 1. Although China and India, major consumers of Iranian oil, do not support it, it will regardless deal a serious blow to the Iranian economy. Psychological pressure on Iran has continued as well. As U.S. Defense Secretary Leon Panetta said in a televised statement, the United States is prepared to strike Iran’s nuclear facilities. According to him, the global community will not tolerate Iran acquiring nuclear weapons. He also stressed that Washington was pinning its hopes on diplomacy. It was simultaneously announced that the U.S. Senate has begun considering a bill to expand military cooperation with Israel, which would grant that country access to intelligence obtained by U.S. reconnaissance satellites. The U.S. is also planning to provide Israel with cutting edge weapons, including refueling tanker aircrafts, missile defense systems and “specialized munitions.” The list contains exactly the items Israel lacks to strike Iran’s nuclear facilities without external support. It is hard to believe that U.S. President Barack Obama, who had to deal with two highly unpopular wars in Afghanistan and Iraq, would launch any military operation against Iran, especially in an election year. 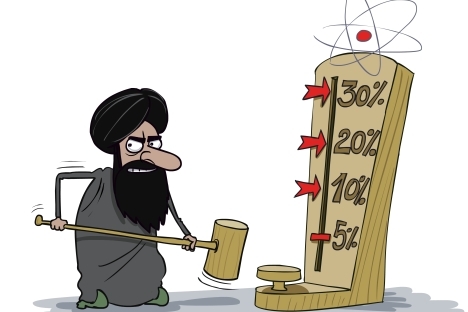 Still, the mounting external pressure may goad Iran into deciding to create nuclear weapons. Just as was the case with North Korea. Andrei Ilyashenko is Voice of Russia's columnist on the Middle East issues.